Franklin India High Growth Companies Fund Growth is ranked consistently in the top 5 performing list, maintaining a CRISIL rank 1 or 2 in the past 3-5 years’ time frame. Franklin India High Growth Companies Fund aims to achieve capital appreciation through investments in Indian companies/sectors, which tend to grow earnings at very fast pace and offer the best growth to its investors. For achieving this, they follow a blend of top-down (primarily macro analysis to identify the sectors) & bottom-up approaches (means micro analysis to pick stocks within these sectors). What are high growth companies? High growth companies are those who have expanded their sales as well as earnings at a much higher rate than that of the general economy. Because these companies tend to grow earnings at a fast pace, they will typically have higher valuations (P/E) and have the ability to give excellent returns. Now let’s go ahead & see how this fund is & how will it help you to grow your wealth. A fund that invests in stocks of companies/sectors with high growth rates or above average potential. The fund was launched on July 26, 2007. Currently, the fund is managed by Roshi Jain & Anand Radhakrishnan (w.e.f. May 02, 2016). Both of these fund managers are managing several funds of Franklin. Also, they have an excellent track record of giving good returns in bear phases of the market. The leading consistency of this fund is extraordinary, on a daily rolling return basis; the fund’s annual return was higher than the benchmark’s nearly 82% over the past five years, indicating that the fund has done very well during most of the ups and downs. The fund has outperformed both its benchmark (CNX 500 Index) and the category (average performance of diversified equity schemes, defined under the CRISIL Mutual Fund Ranking) across various time frames. The fund has outpaced its benchmark as well as peers during bear and bull phases, except during the global financial crisis of December 31, 2007, to March 31, 2009. The fund’s outperformance over its benchmark and peers is definitely because of its superior stock selection and right sector calls. Also focus on high performing stocks such as Amara Raja Batteries, Tech Mahindra, MindTree, JK Lakshmi Cement and TVS Motors are top contributed to the fund’s higher performance. A lump-sum investment of Rs 1,000 in the fund five years ago would have grown to Rs 1870 by October 21, 2016 (absolute returns of 187.2%). Similar results are observed in the case of a monthly systematic investment plan (SIP). The annualized returns over the last 5 and three years are 23.5% and 29.6% consequently, which is of course excellent. 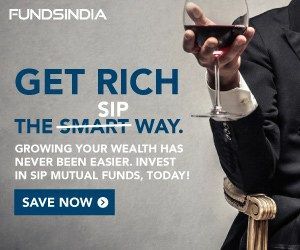 For instance, Rs 1,000 SIP started in the fund five years ago would have given you Rs. 112,557 (where you have invested only Rs. 60,000) whereas a similar investment in the NIFTY CNX500 Index has returned 17.11% and 12.87% respectively. Notably, although the fund has higher exposure to small and mid-cap stocks of 37.28% as against the peers 31.49 per cent, fund has managed to deliver lower volatility (Standard Deviation of the funds is 17.43 percent). 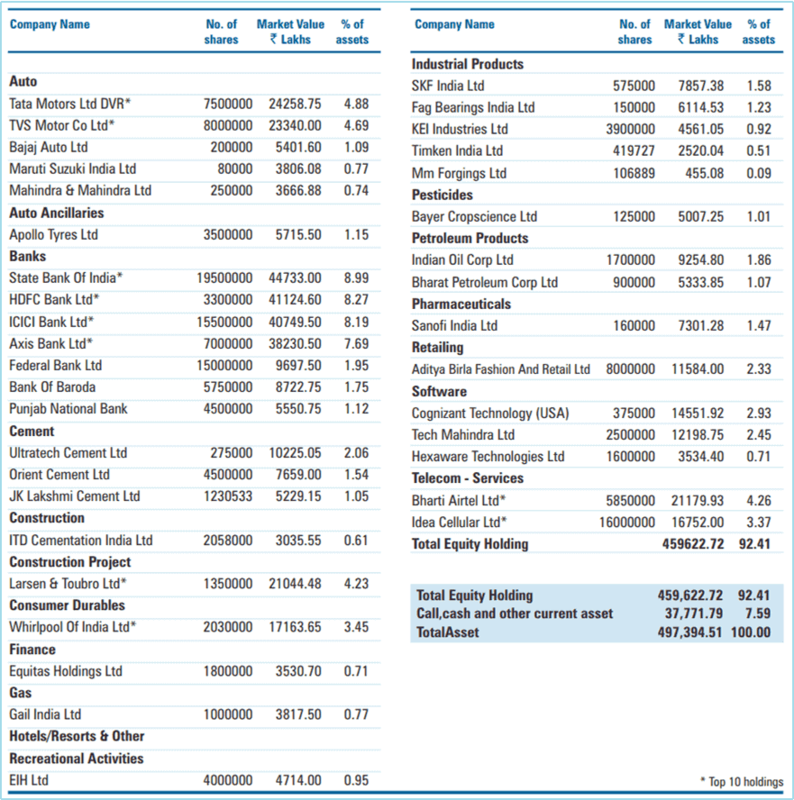 The fund holds a compact portfolio of just 35 stocks over 16 different sectors. 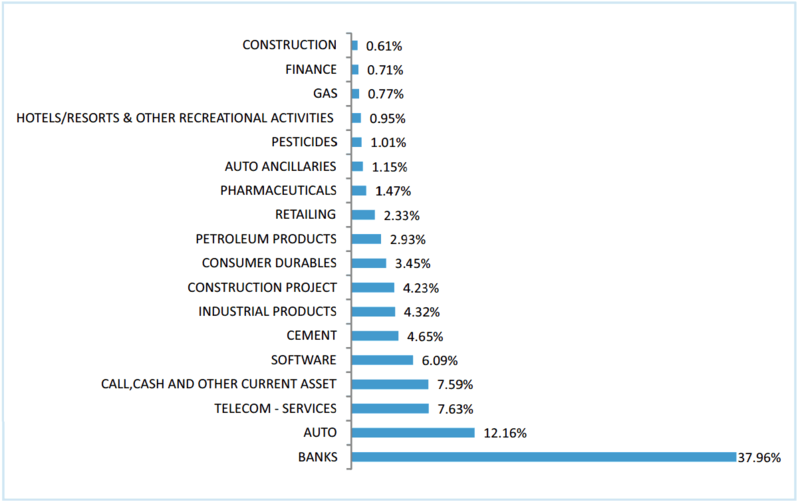 Its top 10 holdings account for 42 percent of its portfolio. The fund has always adopted a buy and hold approach since its inception. It also sports a low portfolio turnover ratio (just 0.33 times in last one year). In the past, exposure to mid and small-caps has gone up to nearly 38 percent of the portfolio. Currently, it has a good mix of the small cap (2.49%), mid cap (34.77%) and with large caps accounting for nearly 62 percent of the corpus. ‘The fund dynamically manages its market cap allocation based on the risk-reward offered by the stocks at any point in time,’ says Roshi Jain of FI High Growth Companies. The fund also takes contrarian bets. For instance, over the past two years, it has steadily increased exposure to SBI, ICICI Bank, and Axis Bank that have faced loan default troubles — these stocks now account for almost a quarter of the portfolio. Except for HDFC Bank, all the banking stocks in the portfolio have been punished on the bourses, so have other cyclical picks such as L&T. This contributed to the fund’s poor run last year. It’s 0.3 percent return last year pales in comparison to the nearly 3 percent return of the benchmark Nifty 500 and the 4 percent category average return. But these now under-performing stocks could pay off handsomely when economic growth picks pace. Meanwhile, the fund’s other significant cyclical holding — auto and related stocks — delivered well last year. With the flexibility to invest across market caps, the fund ups its exposure to mid-cap and small-cap stocks when it senses the opportunity in the market. For instance, over the past seven months, it picked stakes in ITD Cementation India and KEI Industries. The fund also looks beyond Indian shores for the opportunity. It has about 3 per cent of its corpus in US-listed Cognizant Technology. While this suggests a growth investing strategy, the fund’s stock picks and sector shifts indicate a blend with the value investing approach too. With a relatively large corpus (about ₹5,042 crore) and low portfolio turnover (about 33.31 percent), the fund’s expense ratio (2.32% percent in October 2016 on the regular plan) is lower than the category average (2.64 percent). 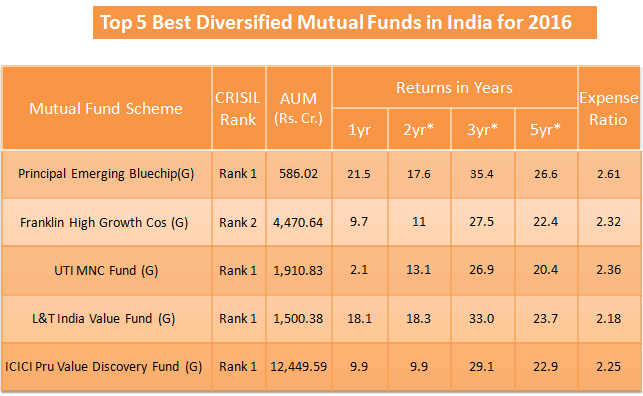 Franklin India has outpaced all other funds in the diversified mutual fund’s category. As compiled by me, I placed this fund at number 2 spot. Other best performing funds like Principal Emerging Bluechip, UTI MNC Fund & ICICI also have given good returns compared to Franklin, but considering its growth strategy, I feel that Franklin will perform great in coming days. As I have said in my previous post, a fund is riskier if it swings more than the benchmark indices. If benchmark falls 5% and the fund falls 10%, then the fund is riskier. The swing of a fund in comparison to market is measured by means Standard deviation and Beta. Greater the standard deviation means riskier the fund. The standard deviation of the fund is 17.43%. The beta of less than 1 means the fund has less risk compared to Benchmark index. In our case, Beta is 1.05 that means if benchmark index grows by 100% then this fund will grow by 105% and the same thing applies to fall. Among the top 5 Diversified mutual funds, the Franklin India High Growth Cos Fund is moderately risky. Though it is less risky, it has given by best returns than any other mutual funds in last 3 to 5 years. Lower the Expense ratio, better the returns. The Franklin India High Growth Companies Fund has 2.32% for Regular Plan & 1.07% (as on 30th September 2016) for Direct Plan of the asset under management every year as the expense ratio. Now almost all mutual funds have launched Direct plans. I would advise you always to choose the Direct plan as they give you more returns than Regular Plans. This Diversified mutual fund does not charge any entry load, but it charges 1% exit load if units are redeemed within two years of investment. Normally all the funds charge this load if units are redeemed within one year, so if you are planning not to take out funds within two years, this is the best bet for you. The minimum investment in SIP should be at least of Rs. 1000. Exit load of 1% – if units are redeemed within two years. Like other mutual funds, there are four separate plans. How to invest in the fund? There are 6 ways to invest in mutual funds which I already have explained in my previous post. I would advise you to go for the online option with the Direct plan to get better returns. Franklin Templeton Mutual Fund is known worldwide for its process is driven investment approach. Despite its large cap content, Franklin has outperformed its benchmark NIFTY CNX 500 Index by a major margin across 1, 3 and five years time frames. Franklin India High Growth Companies Fund scores high on consistency too. Over the last five years, the fund has been successful in outpacing its benchmark returns almost 73% of the time. The fund not only outperformed the NIFTY CNX 500 Index during bull phases but also has managed to contain downsides during market falls. This fund has all the makings of a moderately risk high return investment proposition and is expected to perform in a current manner in the future. Looks like this fund is not in top list in moneycontrol site. Returns for last 1 year not so good. Hey Anurag, if you see all mutual funds have given less returns than last year as Sensex was down more than 6-7% from its last year high. To check your fund’s performance, you should compare returns with the benchmark, it will give you idea of how your fund is performing.